Sitting on the Arizona Grand Canal, Sage is a condo development tucked into a residential neighborhood near downtown Scottsdale. They quietly sold out of phase 1 in early 2013, and now Phase 2 is in full swing. If you are looking for a new construction townhome or condo, you'll definately want to consider these. The builder has made some modifications to the residences in the second phase, including a solid mahogany front door, and Heirloom Ashford oiled engineered wood flooring. Kitchens have counter-height bars, Brazilian white granite counters, and solid maple wood cabinet doors. Bathrooms have marble vanity counters, and the master has a deep soaking rectangular bathtub. Luxury buyers can enjoy some of the technology improvments too, like the USB port chargers in the kitchen and a wi-fi capable thermostat. The living area wall has been prepped for a wall-mounted TV with a concealed conduit for AV cables. There are interior upgrades, but we'll let the rest be a surprise. Sage consists of two buildings with 72 new units, and has two and three bedroom floor plans ranging in size from 1,375 square feet to 1,659 square feet. 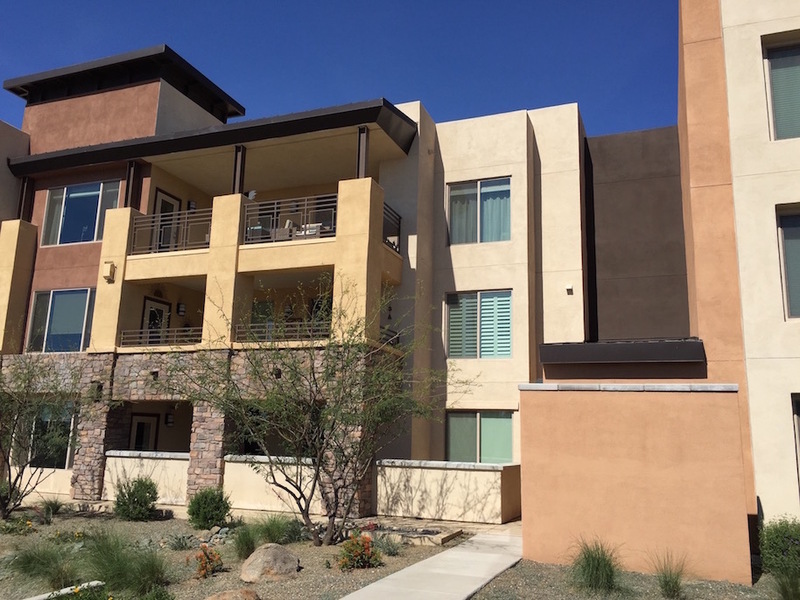 The buildings are three-story, giving buyers a range of options, starting on the ground floor with the extra-large gated patios giving direct-access to the canal, all the way up to the third floor where there are direct views of Camelback Mountain to the West, or Four Peaks and the Superstitions to the East. One of the big draws to the Sage location is that it sits right on the Arizona Grand canal, great for an evening stroll or bike ride. Downtown Scottsdale is a half mile distance on the canal walking path. Our team has extensive experience selling in this community. Contact us and let us help you decide if Sage is the right place for you. The 85251 zip code has the highest concentration of condos, lofts and townhomes in all of Scottsdale. This are includes downtown Scottsdale and is home to many of Scottsdale's high rise buildings like the Optima Camelview and the Scottsdale Waterfront. If you love to walk to shopping, restaurants and nightlife, make sure you check out condos for sale in 85251.